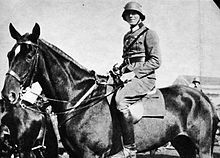 Claus Philipp Maria Justinian Schenk Graf von Stauffenberg (15 November 1907 – 21 July 1944) was a German army officer and Catholic aristocrat. He was one of the leading members of the failed 20 July plot of 1944 to kill the German dictator Adolf Hitler and remove the Nazi Party from power in Nazi Germany. Along with Henning von Tresckow and Hans Oster, he was one of the central figures of the German Resistance movement within the Wehrmacht. This page was last changed on 7 January 2018, at 04:39.